As a general rule it isn’t a good idea for a lawyer to represent both parties in a divorce action or any sort of contractual matter where the parties have conflicting interests. Not only is it not a good idea, for all I know it may be unethical for a lawyer to serve two masters in this way. The Two Masters Principle applies pretty much whenever you find yourself in the middle of things, whether you are trained in the law or not. If you are a volunteer umpire in a children’s baseball game, you take special care to remain utterly impartial when it’s your child’s turn to bat. The town mayor who sells a parcel of land to a developer for four million dollars and then votes to approve an application to build a subdivision thereon is entangled in various conflicting interests and may become more entangled still if the law eventually takes its course. Preachers always need to remember who employs them, God or Mammon. Because being in between is likely to be tricky and beset with conflict, it’s difficult to understand why someone would go looking for a second master if they already had a perfectly good one to serve. But that is exactly what many auctioneers appear to have done. They have invented for themselves another master, other than the seller whose commission they hold, someone whose interests they purport to represent-- the buyer at auction of art, antiques, jewelery, books and the like. The cost to the buyer for this service is upwards of twenty-five percent of the selling price. The more the buyer buys, the more he or she pays. From the standpoint of the seller, though, everything a competent auctioneer does seems intended to benefit the seller-- describing the sale items, advertising the event, coaxing one last bid from a reluctant crowd, offering phone and internet bidding, financing purchases, hosting previews, packing and shipping. Everything, that is, except charging the buyer a ‘premium’ of twenty or twenty-five per cent. The buyer’s premium has the general effect of depressing the selling price of an item by some factor which varies with the circumstances from zero (a houseful of eager, well-heeled but not especially well-informed bidders) to upwards of twenty-five percent. Fewer bids will be offered and those that are will be more carefully calculated when it is clear one is bidding not $1000 but $1250 for an antique vase. The effect is the same as if the auctioneer mumbled rather than cried out or wildly exaggerated the estimated value of a Vuitton handbag. From the standpoint of buyers much of what the auctioneer does is not evidently to their benefit. The more people know about the sale, the greater the competition; the better the description of the book, the more likely the interest in examining it; the better the coffee, the longer some bidders will linger and the more alert they will be. A savvy buyer hopes for a snow storm and bad coffee. So what does the buyer get for twenty-five percent? Not much it turns out, not even the comfortable chairs in the first three rows which encourage people to sit tight. Why does the auction house charge twenty-five percent for a dubious benefit arising out of a factitious relationship? Because it thinks it can. Why does the house keep the money rather than share it with the seller? Same reason. Just because there is a collector for almost anything under the sun, so there is likely to be, somewhere, a collector of the literary works of the Canadian writer May Agnes (Early) Fleming (1840- 1880). Her books are easily found in a variety of states and editions and can be acquired cheaply. Nevertheless, her work remains virtually uncollected, especially when compared to that of the literary Strickland sisters, C. P. Traill and Susanna Moodie, whose lives and work have attracted the attention of collectors for nearly a hundred years. Or, for that matter, Fleming’s nearer contemporary Isabella Valancy Crawford (1850- 1887). No more than fifty highly collectable copies of her single book Old Spookses’ Pass, Malcolm’s Katie, and Other Poems survive; a particularly handsome copy sold recently to a specialist collector for several thousand dollars. However, you can easily find a first edition Fleming for less than twenty. Crawford’s grave in Little Lake Cemetery in Peterborough, Ontario, is marked by a handsome Celtic cross placed there by her admirers. Fleming lies buried somewhere in Brooklyn, N. Y., whence she moved from her home in St. John, New Brunswick. There are, of course, perfectly good reasons to study and collect Traills and Moodies and Crawfords. The Stricklands’ work reports everyday pioneer life in Upper Canada-- you get to see a boozy barn raising and meet the Indians who stop by the cabin to say hello; you discover Susanna didn’t think much of Yankees or the Irish. You find out what went wrong-- why the house burned down or a child drowned. You wonder at the Aurora’s green reflection on a snow-covered lake. Susanna, who as a young woman transcribed the personal history of the escaped slave Mary Prince, is something of a blue-stocking, given to moral calculations and not a little outrage at the general state of things. Catharine Parr, the amateur botanist, is perpetually sunny and given to a watery positivism (“Everything,” she seems to say, “will be all right when the blue-birds return in the Spring”); her image in our cultural imagination matches the one in the famous photograph-- she is pictured setting on the ivy-draped porch, her cheery old face framed in lace, darning sox. The educated voices we hear in the Stricklands’ writing were tuned in a genteel but impoverished household, out in the fragrant English countryside, but things get really interesting when these sensibilities are transported to the stump lots of Upper Canada (One book about the sisters has a perfect title, The Embroidered Tent). So their books are not mere quotidian reports of wood-chopping, soap-making, and berry-picking. Crawford, equally genteel and equally impoverished, struggled with the hegemony of Victorian poetic convention and searched for language capable of authentic, passionate expression. She would have liked Gerard Manley Hopkins. But I think there is another reason why these writers figure prominently in the Canadian literary landscape while May Agnes Fleming is generally ignored by collectors and literary scholars. When it came to earning money, Susanna Moodie, C. P. Traill, and Isabella Valancy Crawford were just about perfect failures. None succeeded in earning much from their writing. The small Canadian market bought little and paid less for their work; American publishers, unhindered by copyright law, happily pirated their work or just paid peanuts. There was a bit of money, perhaps, from England where Agnes Strickland, the influential author of popular works on the monarchy, managed to get her sisters’ work published and paid for. Isabella Crawford’s publisher, Bain, sold but fifty copies of her first and only book Old Spookses’ Pass, and at the end of her short life she relied on a tiny, sporadic income earned writing serialized fiction, short stories and filler verses for popular magazines. And earning money was important to all three writers. Thomas Traill’s failed investments and incompetent farm management drove his family down into poverty which C. P.’s writing barely relieved, and the political career of Moodie, as Susanna called her husband, was wrecked in the partisan jealousies and rivalries of Hastings County where he served for a time as sheriff (a position to which he had been appointed on the strength of a pleading letter Susanna had written to the Lt. Governor). These three wrote in hope of release from penury and in that they were heroic, if not victorious. May Agnes Fleming (born Early) is not nearly so well known or celebrated, but she certainly managed to be better paid. In her time she was the best paid author in Canada, earning more than $10,000 a year in the 1870’s. She “was a master of the minor convention in which she wrote: the suspense-laden serial tale of high life in England and America. Her characters and incidents were simple and stereotyped, but her plots were as ingenious and satisfying as those of Wilkie Collins, and her writing style was vigorous and direct” (Cogswell, Canadian Biography). An interesting new character appears in her later fiction, the private detective. Her life was not without complication and difficulty, and it was certainly short enough-- estranged from her husband, William Fleming, after ten years of marriage, she supported their four children. But she evidently knew what she was writing and who she was writing for, and at one time or another was under exclusive contract with various successful American and British publishers. Her career, although it ended at age forty, combines elements of the careers of Anna Jameson (who published extensively on painting) and Agnes Strickland, both of whom achieved literary and financial success at least in part because they lived independent lives. If you want to know what it took to succeed as a writer, and especially as a woman writer, in the second half of the nineteenth century, a collection of first editions of May Agnes Fleming’s fiction would be a good place to start reading. Towards the end of last year someone wrote with an inquiry about a bird book they owned and were thinking of selling. Their main question was, ‘How much should I ask for it?’ As more and more books are offered for sale on the internet’s open market, the question has become more interesting and the answers more diffuse. Here, in reply, is a foray into the subject-- not the final word, but a start. The book in question is The Birds of Canada by W. Earl Godfrey. Its place in the book market. Godfrey's book, in any edition, is a reference book. A birder owns field guides (which are portable) and reference books (which are not)-- both sorts of bird book are used rather than collected. Collected bird books always feature old, original and extraordinary illustrative plates (Audubon's Birds of America is the best and most expensive example) and are always at least scarce. (Because collecting, gathering, and hoarding are difficult to separate in the field, this statement about scarcity can withstand any number of counter examples). The book's condition. You need to examine your copy carefully. Put yourself in a buyer's place-- and a systematic, picky buyer at that. Godfrey comes with a dust jacket and these are often the first to show wear and are often missing. Is the jacket in a protective plastic cover? Examine the book's covers for damage and wear, are the hinges tight, loose, broken? Is the text block clean? A buyer is going to see any damage; you might as well tell them first. Details are important. Availability. How many copies are currently offered for sale? Are they readily available to a buyer? And at what price? In the case of Godfrey's book, I can find somewhat more than 100 copies in either edition offered for sale, live or on-line. A bookseller in downtown Peterborough about 2 kms from here has two copies for sale, but you can also buy a copy from someone in California. Special features. Most often a particular copy is said to be special and therefore worth more than a comparable ordinary copy because it is signed by the author or illustrator, or because of some special association, e.g., it is from the library of a noted person. A signature alone does not render a book especially valuable unless the book is also collectable in its ordinary state. In the case of a signed, common reference book such as Godfrey's, the most his signature means is that the copy is somewhat more interesting than others-- it might make a better gift than an unsigned copy. I can buy a signed copy with some damage for 50.00 USD today. How you plan to sell your book. Generally speaking, a bricks and mortar bookstore can offer to buy a book from you for a third of its expected retail (which sometimes is arrived at through an intuitive procedure). The rational formula, I am reliably told, is one third for the book, one third for overhead, one third for the bookseller. Internet sellers evidently resort to a variety of pricing techniques, ranging from the technical to the spiritual. The prices of the hundred or so copies currently for sale on-line range from about 150.00 USD on down. Studies suggest the higher the price, the longer the book has been listed. How fast do you want to sell it and why? How much time and trouble are you prepared to spend to get it sold? Ordinarily, the price of a copy on a card table full of stuff at a flea market will be different (presumably lower) from the price in a booth at the Boston Book Fair. So, I guess it depends. If it were up to me, I would expect a premium for Godfrey's signature on either of the two Fine copies I have for sale-- probably $75 for a signed copy, but I would also be prepared to make a price to get the book sold. George Henry Harrison, the author of The History of Yorkshire: Volume I, the Wapentake of Gilling West (a recent acquisition soon to appear here on our web site) is reliably reported as having been born in 1817 at Whashton, Kirby Ravensworth, in the North Riding, Yorkshire. He died in 1890. Beyond that, however, there is mostly speculation and, shall we say, invention. Most of it comes from Harrison himself but some of it comes from others who probably should have known better. For example, the National Archives Catalogue refers to him as ‘General G H de M Plantagenet-Harrison’ and inserts a knowing sic in square brackets, indicative of the cataloguer’s skepticism about the military title. Harrison’s real name, it is claimed, was “James Phillippe, a genealogist,” who “around 1830... began to research the families of Richmondshire.” While it is conceivable that Harrison (or Phillippe) began work on his monumental history of Yorkshire in his early teens (He was thirteen in 1830), it is more likely the cataloguer has condescendingly grasped the wrong end of the stick, for the London Gazette (29 October 1867) reports “George Henry De Strabolgie Neville Plantagenet Harrison, carrying on business as a Genealogist and Herald... in the name of James Phillippe” at various addresses in Middlesex has been “adjudged bankrupt.” Moreover, there is a record showing a George Henry Harrison, one of six children born to Margaret Hutchison (1787- 1864) and Marley Harrison (1772- 1822) of Whashton, Yorkshire in 1817. ‘James Phillippe’ almost certainly is the pseudonym and not the other way about. Harrison did little to clarify matters, however, nor was he overly modest in his claims to distinction and accomplishment. At the outset of his History of Yorkshire, he styles himself “Prince of Plantagenet- Skioldungr, Duke of Lancaster, Normandy, Aquitaine and Scandinavia, Count of Anjou, Maine, Guienne, Poictou, Earl of Lancaster, Chester, Richmond, and Kent” and so on for the better part of a full page. His military resume includes service as a general officer in Mexico during the war of the Yucatan (1843), with the army of Peru (1844), and in Argentina at Corrientes with General Jose Maria Paz and the Army of God and Liberty (1845); in Europe, in the revolutionary year 1848, Harrison claims to have served as General of Cavalry in the Danish army and, later in the same year, as Lt.- General of the German confederation. He ended his military career in 1853, he says, as a Marshal in the Turkish army. It’s not all that easy to know what to make of Harrison. One commentator in Notes and Queries (15 March 1930) simply dismisses him as “a pedigree forger of the worst and most unscrupulous type” and that is hardly surprising given that his own fabulous family pedigree, included in the History, traces his origins back through history and pre-history to the Norse god Odin. But surely this is fantasy, not forgery. It has about it the comic lunacy of a Monty Python sketch. On the other hand, Nancy McLaughlin, reviewing Harrison’s History for genealogy aficionados, seems to accept Harrison’s claims to military eminence. She writes, perhaps thinking of her readers, many of whom may have taken to genealogical research in their retirement, “By the 1850’s he had evidently concluded a most successful and adventurous army career, and had returned to England to devote himself to the study of genealogy.” And it happens that Harrison really was present at Corrientes, Argentina, and did meet with General Paz who remarks in his Memorias postumas that in the second fighting season at Corrientes he was introduced to the “celebrated English general Plantagenet Harrison” who it was said possessed great wealth and whose support was “worth an army”. However, shortly after their first meeting, Paz says, “I suggested a trip to Rio de Janeiro, in order to procure weapons, and used the occasion to get rid of him.” General Paz says that it took but a few words from Harrison to convince him the famous English officer was, in a Spanish phrase which needs no translation, “un maldito estupido.” There’s a good chance, too, that Harrison actually turned up in the Yucatan during the uprising in 1843 and a year or so later in Peru where he commissioned a portrait of himself decked out in the uniform of an ambassador (probably Peruvian), but his part in the South American civil wars and later in revolutionary Europe surely was one meant to be played by Groucho Marx and not George C. Scott. A glance at the ambassadorial portrait which serves as the frontispiece to his History is conclusive. In the early 1850’s Harrison returned to England (triumphantly, he must have thought ), presented himself at the library of the British Museum, and applied for a reader’s card in the name of the Duke of Lancaster. Accounts of what happened next differ somewhat. Modern English Biography (Boase) states Harrison was “banned” from the library; elsewhere it is suggested he was offered reader’s services as plain Mr. Harrison, pace the ducal title (or, we won’t ask and you won’t tell). In any event, Harrison adjourned at once to the Public Records Office as a far more interesting source of raw material and over the next thirty years produced an extraordinary study of land tenure, translating and collating antique documents (“charters, rolls, fines, feoffments, inquisitions post mortem, deeds, books of the Exchequer”) long ago squirreled away and lying dormant in the PRO. Harrison’s researches into Yorkshire real estate, amounting to some thirty hand-written volumes with full indexes, were the source of his projected six volume History of Yorkshire, only the first of which was completed for publication. After his death in 1890, his daughter Blanche offered the complete Ms collection to the PRO which bought a select dozen volumes for few hundred pounds. In 1892 Blanche Plantagenet-Harrison married John Routh, MA, of Clints House, Gayle, Yorkshire. It was recorded that shortly thereafter, Mr. Routh claimed“jure matris [through his mother] the ancient Barony of Swivington, dormant since the reign of Edward III.” It must have been catching. In the course of an internet investigation into the career of the genealogist and historian George Henry Harrison (1817- 1890), author of the History of Yorkshire, I came upon the memoirs of the Argentine patriot and soldier General Jose Maria Paz (1791-1854), a hero of the Argentine war of independence from Spain and subsequent regional conflicts. In Paz’s Memorias postumas I found confirmation Harrison had in fact been present during one of Paz’s campaigns and had met with the general on several occasions. I was interested to discover evidence of Harrison’s military career because he claimed to have served during the period 1842-1853 as a general officer, successively in the Mexican, Peruvian, Argentine, Danish, German and Turkish armies. Perhaps there was some truth to his portrayal of himself later as a military man, in retirement conducting a broad genealogical study of the families of Yorkshire. Harrison also claimed, however, the inherited title Duke of Lancaster, along with other exalted entitlements, and commentators were quick to dismiss him out of hand as an “unscrupulous pedigree forger” or a deluded crank haunting the archives of the Public Records Office. So Paz’s observations promised to help sort some of the fact from some of the fiction. My command of Spanish being not so advanced as to permit reliable translation of the memoirs, I sought a Google translation into English of the passages describing Paz’s encounters with the flamboyant General George Henry Plantagenet Harrison. In the course of the translation it became apparent some unusual things were happening to the English language (Comparisons with Mark Twain’s sketch “The Awful German Language” come to mind). Moreover, it became clear the student who patches together various borrowings (Googles) and calls it “research” had better be forewarned of the dangers of a casual trust in the authority of the Internet in its various manifestations. You might describe the English of the Google translation as “impressionistic” for it does convey the atmosphere of their first meeting without taking the trouble of constructing a coherent narrative; and it has dramatic energy, spilling over impetuously, scarcely connecting words and phrases on its way to the finish-- ‘immense wealth’, ‘sacrificed’, ‘influence of a chivalrous enthusiasm, freedom and glory’. It suggests some dialogue for the scene, “I offer you, sir, my sword and my allegiance to the noble cause of freedom!” One expression in particular promises to brighten the language of business. “Candidates are requested to enclose copies of recommendations pompous with their application” or, “I see from your recommendations pompous that you are acquainted with Lois Tuttle.” Perhaps it will catch on. Who got to wear the biggest hat, who wanted to be the brigadier, and who wanted to be the colonel in this army (It was called “The Army of God and Liberty”) may not be clear, but it is clear that Paz soon found Harrison’s manner “a crazy bizarre” and disentangled himself from the proffered alliance, and that was probably that for General Plantagenet Harrison in the Argentine wars. It was time to move on to another promising conflict and there once again offer his no doubt inimitable services. One element of style is tone; that is, the tone of the voice the writer causes us to hear in the writing. And I have to report that the voice I began to hear in this Google translated English is none other than the voice of W. C. Fields faking linguistic familiarities. Ingenue: “But Uncle Bill! The directions are all in Spanish! How are we going to find our way out of here?” WCF: “Now, now. Don’t you worry, my dear! I am fluent in fourteen languages, including Swahili and Northumbrian which have no dictionaries. I’ll get us out of this fix. Now, it says here....” He waggles his hat and begins to read. The inverted commas belong to the Google translator which acknowledges the misstep but denies responsibility for taking it. Google has stumbled into this linguistic pot-hole because it miscalculated the change of diction when “irritation generated in many of his contemporaries led to the qualification of being” is followed by what’s between the inverted commas. It is comic, really, the stylistic counterpart of the banana joke. (Charlie comes out of the bank eating a banana. He casually tosses the banana skin onto the sidewalk and saunters off down the street, finishing the last of his banana. Along comes a cab and out of the cab emerges an over-stuffed, wealthy socialite holding a white poodle under one arm. He is so busy preening and fussing over his doggy companion he fails to notice the banana peel.) When language veers unpredictably and surprisingly from one level of diction to another, banana peels are everywhere. And what happened to General Jose Maria Paz, late of the Army of God and Liberty? Something of a miracle, really. He lived on to celebrate the victory of the Unitarian forces and the end, for the time being anyway, of civil war in Argentina. The Google translator tells us, “That was his last political act; he died a few months later, and was buried with highest honours for his patriotism. [Later] during Domingo Sarmiento’s presidency, his body was taken to the Cordoba Cathedral, together with the recuperated remains of his wife.” Just so, and even now the appropriate secretariat at the Vatican, on Google’s authority, may be opening a file on the miraculous resurrection of Mrs. Paz, and the first pilgrims are trekking toward Cordoba. Somewhere in Walden, Henry Thoreau admonishes us to keep our eye on the important things and avoid being distracted by frivolous demands on our attention, no matter how urgent. We should be, he says, like the train and not be derailed by every mosquito that lands on the track. But I have to confess to an occasionally vagrant mind. Sometimes I just can’t resist being side-tracked in the course of uncovering information about what is to me a new writer or new book, and as I have noted elsewhere on this site, if I can’t resist the temptation, sometimes I decide not to. In the result, I often wind up in territory which bears little resemblance to that in which I had begun poking around. For example, I recently acquired a scarce copy of Lake Hopatcong the Beautiful by Hudson Maxim; it is a plea to preserve this beautiful northern New Jersey lake for public enjoyment. I bought it partly due to a lingering sentimental attachment to the lake itself which I had visited as a child and partly because it was an interesting item of New Jerseyana. When I had finished researching Maxim’s book (and I won’t bother you with the travelogue), I found myself in a gravel pit on the outskirts of Dover-Foxcroft, Maine, where on a sunny weekend the members of the Hiram Maxim Historical Society were enthusiastically blowing up pumpkins and riddling the carcasses of wrecked cars with .50 and .303 calibre machine guns, some of which were for rent. You see where such vagrancy can take you. Not every sidetrack is as interesting as that one into the culture of central Maine, and I have learned to resist certain temptations to veer from my path. Bad writing of various kinds and erroneous assertions of fact have less attractive power than once they did. After all these years of editing and marking papers, my blood pressure just barely flicks upward when I read on the home page of a prestigious scientific organization this slab of inflated institutional prose, “The Council believes in the critical importance of collecting, preserving, and making accessible the accumulated knowledge about plants for present and future generations.” The impulse to highlight the offending passage and note, “Revise! You forgot past generations!” doesn’t last, and I am content to leave skirmishes like this to others. When I read in the Proceedings of the Mars Society that “a search party was put afoot to hunt” for the MacAlpine Aerial Expedition into the Arctic, it’s apparent the five authors of the paper were unaware that in the circumstances a ground search was not seriously contemplated. They seem to have tossed an extra fact into the story like an extra potato into the stew pot. As it happened, a sizable posse of bush pilots flying just about every plane they could persuade to get off the ground, in two months of searching, flew thousands of miles across the Arctic, covering 300,000 sq. miles, looking for the lost expedition (Szurovy, 38). You’d think the Mars researchers might have noticed. But poking these holes is no fun. I just dump the spoiled information and hope my mission to Mars doesn’t wind up in a jackpot like the MacAlpine outfit did. The Tough brothers, along with Oakes set out by foot at midnight for the mine. It was 52 degrees below zero as they walked the seven miles through a beginning snowfall. After driving in their stakes, they toasted what they called the Tough-Oakes Mine. Moments later, the former owner of the mine, William Wright, walked into view. Wright saw what had happened, knew he’d lost his claim, and hurried to stake new ones adjoining the Tough-Oakes claim. Later, he and Oakes formed a partnership and made further claims at Kirkland Lakes. I’ll grant outright this sort of story-telling would have made Mark Twain want to spit (See Fenimore Cooper's Literary Offenses); he would have scorned the writer’s sense of verisimilitude, something like this: Why did they check the temperature before setting out and why is it reported so precisely? Oakes and the Toughs weren’t the sort to be put off by weather and it’s unlikely they consulted the Weather Network before heading out. It was more like, “Come on, Harry. Let’s get moving. It’s damned cold tonight. Better wear your hat.” “After driving in their stakes, they toasted what they called the Tough-Oakes Mine.” Driving stakes into the ground at 52 below? What were they toasting with? Even in the hands of Twain, though, this sort of comment easily wears thin and seems small-minded; more important, it misses the point of the story. Why, for example, does the writer state the precise temperature at which the party set out for the mine? It couldn’t have mattered to the superbly eponymous Oakes or Toughs. The writer records the temperature because her readers would have glanced at the thermometer before venturing outside, and if it had told them it was 52 below, would they have gone outside? Not unless they had to. Down to the store in Sangerville, the few customers who’d ventured out would be slapping their mitts together and exclaiming, “52 below this morning up at my house!” And who are her readers? The citizens of Sangerville and their kin who, in this story, are the people Harry left behind when he took a tearful farewell of his family, headed out of town looking for adventure in the Klondike, and never again came home for Christmas (In fact, he renounced his U.S. citizenship and became a Canadian). So there is truth in this story, even if the facts are bent and misshapen here and there, and having this little piece of Harry helps her readers feel a bit better about things, which is pretty well the point in telling it. You might think the town of Sangerville, Maine, population nowadays about 1500, has a lot of explaining to do. One thing in particular it might explain is its native sons, the Maxim brothers, Hiram (1840-1916) and Hudson (1853-1927), inventors respectively of the machine gun and smokeless powder which, taken together, have been the cause of most of the casualties, military and civilian, in the wars of the twentieth and twenty-first centuries. Another is Harry Oakes (1874-1943), born a generation later in Sangerville, multi-millionaire owner of the Lakeshore gold mine in northeastern Ontario, but that explanation will have to wait until another day. If you just can’t wait, your preliminary reading should include Who Killed Sir Harry Oakes by Marshall Houts (1976), Who Killed Sir Harry Oakes by James Leasor (1983), and Who Really Killed Sir Harry Oakes by the prime suspect, Alfred de Marigny (1990). I should point out that, three books on the question not withstanding, the only established facts in the case are that Sir Harry Oakes is dead and the Duke of Windsor did not himself murder Oakes. According to the town history, “During the Spring of 1914... the Sangerville Woman’s Club erected a sign on the lawn of the Town Hall attesting Sangerville as the birthplace of Sir Hiram Maxim [and Hudson Maxim]. Presentation of this honor to the town was made by Mrs. Minnie Hayes, President of the Woman’s Club. The sign was a project of the club conforming to the Community Improvement Department of the New England Conference of the State Federation of Women’s Clubs. 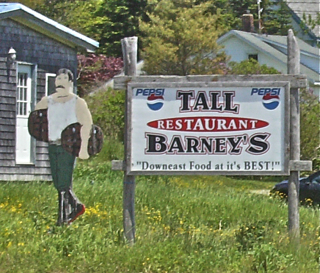 Nearly three decades later, the original sign was replaced by one proclaiming that Sir Harry Oakes was also a Sangerville native who was Knighted by the English Realm. Hence Sangerville became known as the Town of Two Knights....” So perhaps if the town is going to take some of the credit and, as it were, bathe in the reflected glory of its native sons, it should be prepared to bear some of the responsibility for their exploits. In the town’s defense, though, it needs saying that the Maxim brothers did not linger in Sangerville. After completing a few years of public school, the two brothers went looking for work elsewhere, Hiram being apprenticed at fourteen to a carriage maker. In this respect, as well as in some others, the Maxims’ story resembles that of their contemporaries Thomas Edison (b. 1847) and Henry Ford (b. 1863), small town or country lads with little if any formal education and little apparent promise. But born tinkerers, and the country seemed full of them. At fifteen, Ford was fascinated by watch-works, and when you visited the Fords it was a good idea to keep on eye on your watch or their Henry would have it neatly disassembled in no time. Edison, a young railway telegrapher, chose the quiet night shift because in the long stretches between messages he could conduct intermittent investigations into electricity. Hiram Maxim invented a self-loading mouse trap in his spare time at the coach works and set out to rid the mill at Abbot of its abundant rodent population, in some ways pre-figuring his later work with automatic weapons. Hudson began a life-long interest in chemical compounds, especially those formulas that produced dramatic reactions. And they never let their skimpy education hold them back. If they lacked formal scientific training, then they preferred a sort of inspired horse-sense from which every man if he would but apply it could profit. Henry Ford was known to fulminate on the subject and, as an example, had a truck full of carrots dumped in front of the lab at Greenfield Village with instructions to find uses for the pulp (Grandin, Fordlandia). They therefore preferred trial and error to the scientific method. At his plant in Menlo Park, N.J., Edison collected examples of ‘every material known to man’ in order to supply the trials he conducted at the facility. He distrusted trained scientists, such as his sometime employee Nikola Tesla, whose theoretical knowledge of physics and chemistry could predict an outcome with some certainty without running endless unsuccessful trials. Somehow it didn't seem to trouble Ford and the others that there was a great deal of error in the trial and error method. Later in life, after the mouse trap, Hiram Maxim designed and built a flying machine. It is was powered by two enormous steam engines, but it did not occur to him they would be a hindrance to flight until he had gone ahead, built, and tested the contraption. With unforeseen errors came accidents, to which these naive geniuses, or their associates, were unusually susceptible. One of Edison’s employees, who volunteered as an experimental subject in the development of a fluoroscope, died as a result of being exposed to certain electrical rays. Sir Hiram Maxim had enough sense to launch his heavier than air machine, pilotless, along a railway track; nevertheless, as a result of personally firing an estimated 250,000 demonstration rounds of .303 ammunition to impress various financial punters with the murderous potential of his Maxim gun, he was rendered quite deaf. His brother Hudson, whose investigations were chemical rather than mechanical and who was described as a “chemist”, lost his left hand in an explosion resulting from his tinkering with the properties of fulminate of mercury in combination with certain other compounds. Their tinkering was free-ranging and, certainly to its practitioners at least, appeared universally applicable no matter the particulars of the question. In what became known as “Fordism”, Henry Ford sought to apply certain elements of industrial design, along with his puritanical values, to the everyday domestic affairs of his workers who could expect visits from a Ford “social committee” whose inquiries as to whether alcohol was kept in the house, how many people occupied each bedroom, and whether toilet paper was in ready supply were meant to ensure a healthy, efficient, and non-unionized workforce. Ford created several communities after his own design, for example an Upper Michigan village based on a sawmill; more ambitiously, in the Amazon he created ex nihilo a rubber plantation whose streets and houses were modeled after those of an idealized midwestern or New England town. Sir Hiram Maxim, Bt., designed an electric light (the subject of a patent dispute with Edison) and a steam inhaler to relieve symptoms of respiratory distress (from which he suffered). Hudson Maxim, who had something of a literary bent and is pictured wearing a slouch hat set at a rakish angle, published a work of literary theory in which he applied the principles of chemistry and physics as he knew them to the understanding and composition of poetry (The Science of Poetry and the Philosophy of Language). His thesis was that the language of the great works of English poetry exhibits regular, rule-following, and therefore predictable patterns of application in which certain fundamental, irreducible elements are combined to produce, say, the works of Shakespeare, Milton, and Wordsworth. It followed that these eminent practitioners of poetic language somehow must have been aware of the elements and principles of poetic composition, whatever they might be, and that literary expression generally should adhere to them. So, to address the question of responsibility. It’s clear Sangerville, Maine, is innocent when it comes to the work of its inventor sons. Just as innocent as Greenfield, Michigan, and Milan, Ohio, and any number of other obscure places from which inventors, industrialists, and various other magnates issued in the latter half of the nineteenth century. The fact is, it was happening everywhere, a ferment of invention and a fever of industrial expansion. Patent applications and attendant legal challenges flooded Washington, once darkened farmhouses glowed with electric lights, people took the bus to work, adolescents found out of the way corners to park their model T’s, and, during the wars, the Maxim brothers’ guns and ammunition destroyed armies on every side. Sangerville couldn’t have stopped it if it wanted to. On a day which seemed right for taking up unfinished business I set out to buy a copy of Hummingbirds by Crawford Greenewalt, a book noteworthy for its photographs of hummingbirds in flight, which I had last seen leaving a friend’s bookshop tucked under the arm of a biologist from the Ministry of Natural Resources. So rather than wait a week or a month or even a year for a second copy to come through the bookshop door (“You never know,” he always says), I went shopping for Hummingbirds on the Internet, looking to find a copy suitable as a present. The experience was wholly different from shopping at a conventional bookstore, and I’m far from certain booksellers who offer books for sale online, already absorbed in finding, describing, pricing, promoting, and shipping their books, appreciate what for a book shopper can be a strange and tangled market. Just as many shoppers do, I might have started by visiting Amazon, the grandest of the grand marches. If people know one shopping site, they know Amazon, and for many it’s all they want to know. Or I might have visited ABE which probably out-sells Alibris, and with millions of books of one sort or another on its database and thousands of booksellers as clients, recently proved an attractive acquisition for Amazon. But in order to search as widely as possible, I went to Addall.com, a site which searches twenty-four book-selling data bases including Amazon, ABE, Alibris, Biblio and the like. I also searched Ebay where, on an April evening, among 873 “results” I found a number of copies of Hummingbirds, some at auction and some offered for immediate sale. As soon as you enter “Greenewalt” and “Hummingbirds” you are admitted to an unusual bookshop. The Hummingbirds Bookshop carries one title and one title only, in this case Crawford Greenewalt’s Hummingbirds (Garden City: Doubleday, 1960)-- one hundred and forty-six copies when I visited the shop on 20 April 2011. It’s a small bookshop by any standard, but there are on the Internet’s Street of Bookshops thousands and thousands of bookshops just like this one, each carrying a single title. The largest of these shops are those with many hundreds of copies of a particular title in stock; the smallest, certainly, are those offering just one copy of a single title for sale. The many “Books for Sale” signs run all down the Internet street and out of sight, and every doorway admits you to a one title shop. While the Hummingbirds Bookshop is comparatively small, shopping there is a surprisingly complicated affair. For one thing, although they are all “the same book”, the prices asked for various copies of the trade edition range from $29 to $475. Off in a private alcove you will find numbered copies of the limited edition, gilded and clad in leather, as well as a few copies signed and inscribed by Greenewalt. The prices for these eight special copies range from $175 to a cool grand. Among the 138 trade edition copies, you can find two in the $400 range, five in the $300 range, and nine in the $200 range; but many more copies (25) are priced below $100. You might think the differences in price were, at least in part, owing to differences in the books’ condition, and no doubt some are, but a difference of a hundred dollars or more ordinarily would suggest the cheaper copy’s binding suffered from serious structural faults or some of the plates were missing. However, the only faults noted in the short Addall descriptions seem fairly minor, excepting only an absent dust jacket or two. Here is a sample of what you are told about condition (You probably would learn more when you took the book down from the shelf and read the bookseller’s description, but what would make you take it down and look? ): F, tear, fn/vg, VG/G, sm trs ink in ow, very good, good, ow VG, waved, Fair to Good, torn. Why would one copy of the trade edition be priced less than $50 while another is priced in the same range as the high-rent limited edition? The chief interest in Greenewalt’s book is the colour plates of hummingbirds in flight which he photographed with his own specially designed equipment. Several descriptions give the number of plates as 67, others as 69, and still others as 70. Are some plates missing or was the bookseller’s count inaccurate? Perhaps someone counted a frontispiece as a “plate”. This isn’t like old fashioned catalogue shopping with L. L. Bean. There’s too much information in one way, and not enough in another; some of the information is only apparent, not actual; the descriptions, when they aren’t erroneous, are couched in an arcane shorthand; and the price structure seems to arise out of mysterious calculations. And that is to say nothing about print-on-demand services which create a copy only if you will buy it.